Ampenan-Mataram-Cakranegara-Sweta, or more simply referred to as Ampenan, is a vibrant district located on Indonesia's lush Lombok Island. The sprawling metropolis is comprised of four towns, the boundaries of which are indistinguishable to the casual visitor, and is host to a population of around 250,000 people. While Sweta is the main transport hub and site of the island's biggest market, it is bustling Ampenan, the old port town furthest west, that is the main tourist area and the location of most shops, hotels and restaurants. Most visitors pass through the area fairly quickly but there are one or two sights worth seeing nearby, including the weaving factories in the capital Mataram, whose processes have remained largely unchanged for hundreds of years, and a weaving village to the south where traditionally dressed women work on wooden handlooms. There are a number of shrines and temples open to visitors, the best of which are centred around the Mayura Water Palace, dating from 1744 and used by the royal court during the Balinese rule of Lombok. 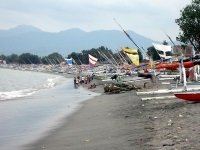 Ampenan, being an old port town, has a beach still lined with hundreds of fishing canoes. As the fishermen mostly go out at night, it is fun to watch the boats setting off in the late afternoon, and seeing the sun set over the water. Ampenan's market, which is the areas primary attraction, is located along the main road to Senggigi, north of the city proper. The Pura Segara Balinese temple is close by on the beach.